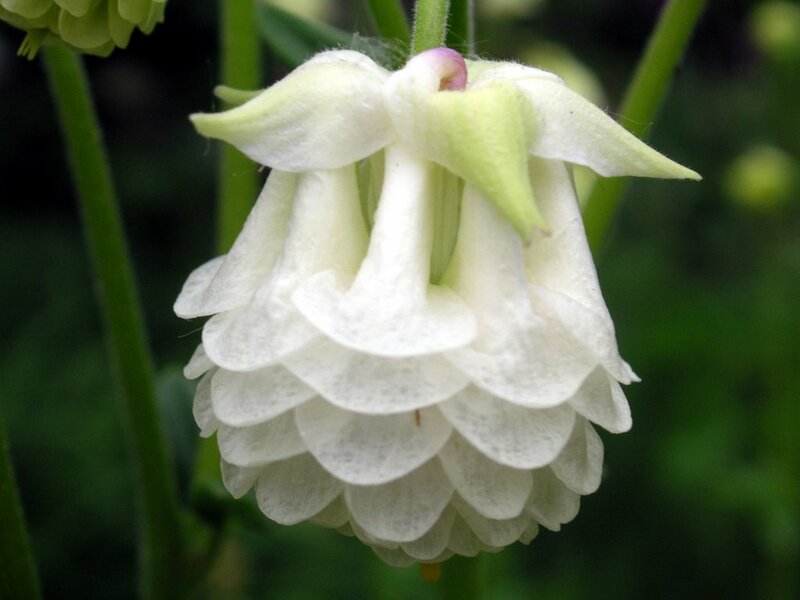 I struggle sometimes pronouncing the the Latin names of my plants, until I found this site. 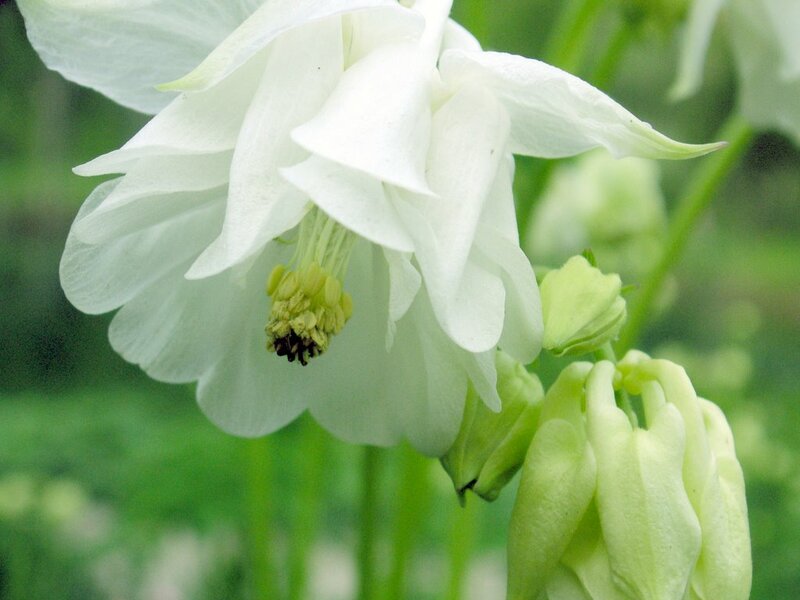 ...than to rely on common names. This is a picture of Hyacinthoides non-scripta. 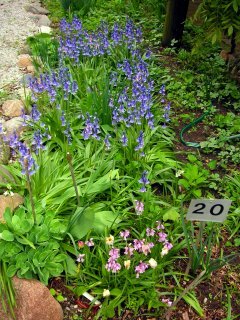 These beautiful blue and pink (bottom of pic) flowers in the arbor bed at the site have many common names: English Bluebells, wild hyacinths, wood hyacinth, nodding squill, and wood bells. 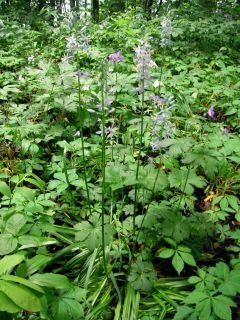 I identified the wildflower posted earlier as wild hyacinth but it is clearly a different plant from this wild hyacinth. 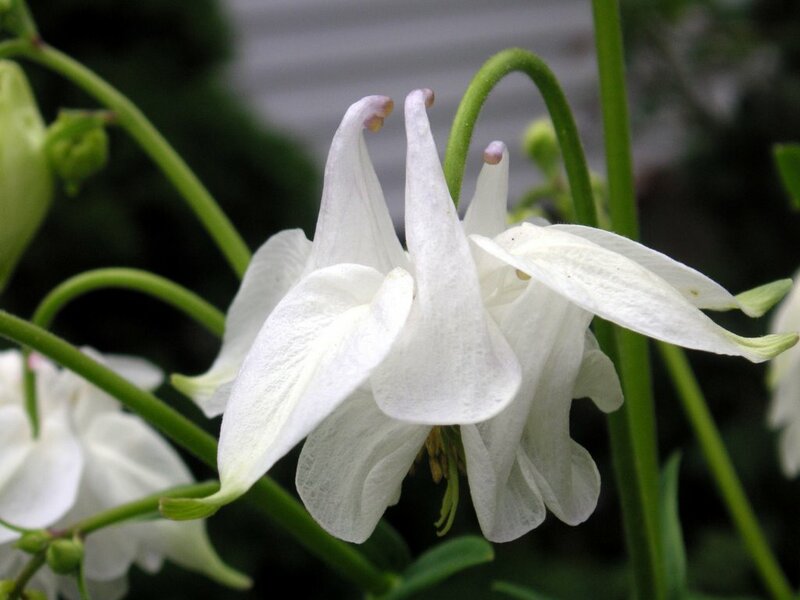 In fact, the earlier picture isn't even a hyacinth, though its common name would indicate it. And I rambled on about how it differed from the cultivated hyacinth. 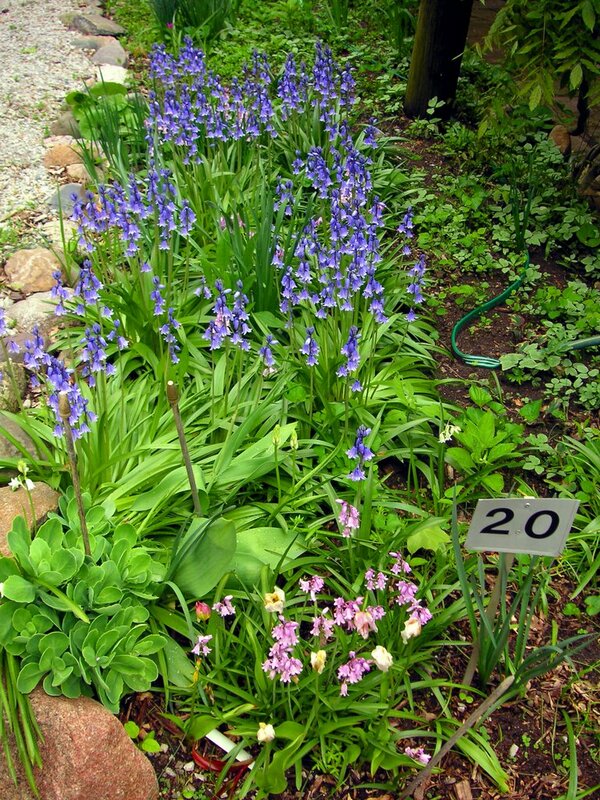 The forced hyacinth bulb you can purchase at the grocery store in January was hybridized from a different species within the hyacinthoides genus. 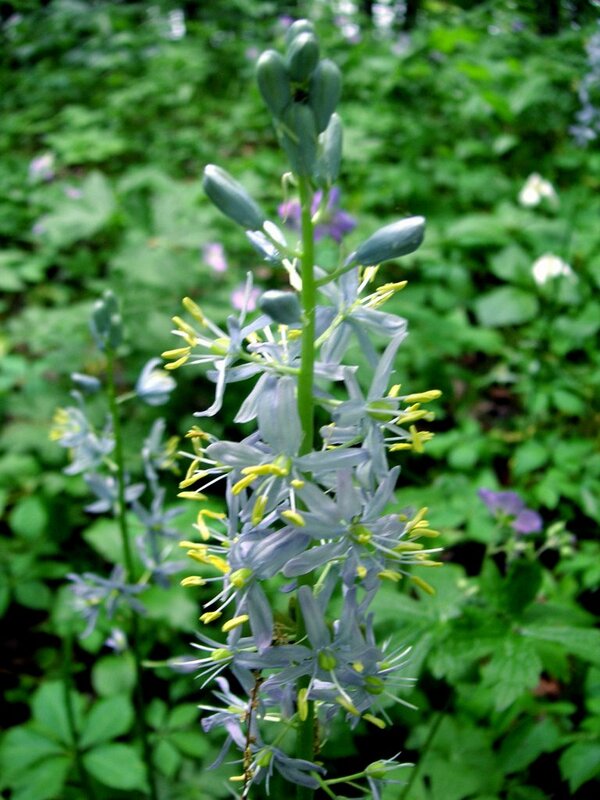 Here is a closer view of the wild hyacinth. Note the dominant stamens, which are hardly visible on the cultivated variety. 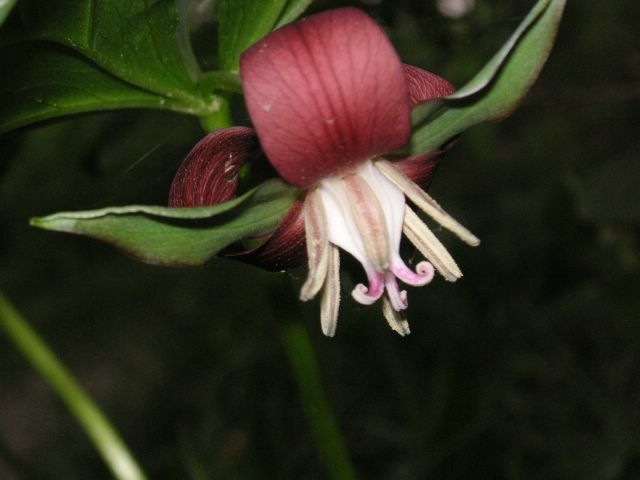 The stem is slenderer and there are fewer flowers on the wild species. I discovered this delightful blue spikey flower next to the the trail yesterday. 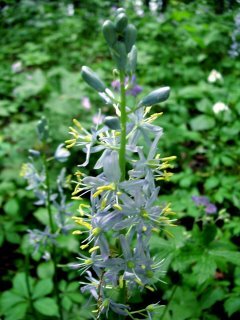 It is wild hyacinth. As much as I love hyacinths, this delicate version is much prettier. 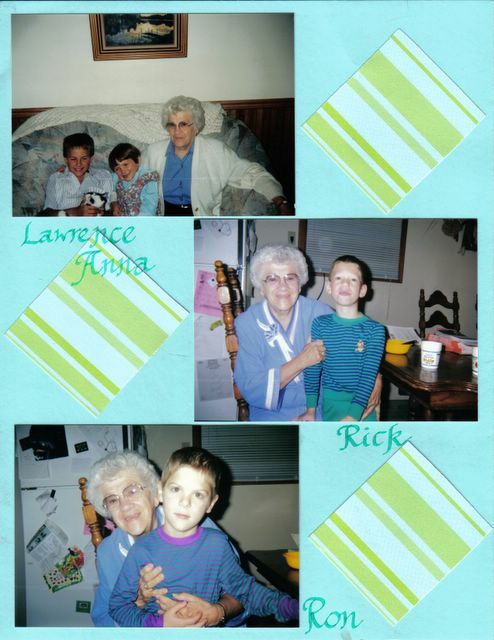 The menfolk in my family were so sweet last Sunday. Steve grilled salmon, made a new mashed sweet potato recipe and prepared asparagus freshly cut from the garden. Ron set the table (properly!) with the china, crystal, silver, tablecloth and cloth napkins, and candles, with the comment, "Mom, why don't we eat like this everday?" They permitted me time to futz with a bouquet (lilacs, wild phlox, iris). 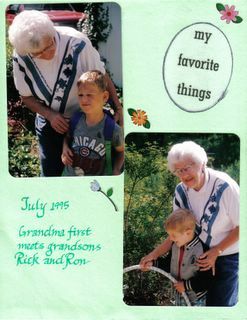 And Ricky made me a card with this sentiment: A Mom that makes everyday a wonderful day of surprises and happiness! And they gave me a new pair of Crocs! 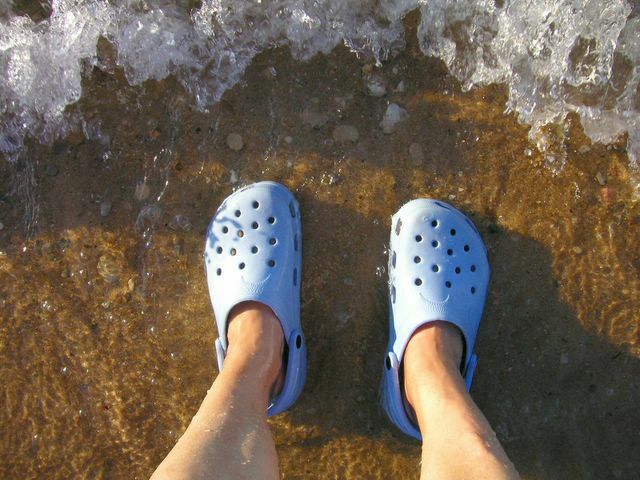 Somewhere, somehow, I lost my Crocs from last year and I was sure missing them. Herself, the fairest flower of all. Her last birthday. 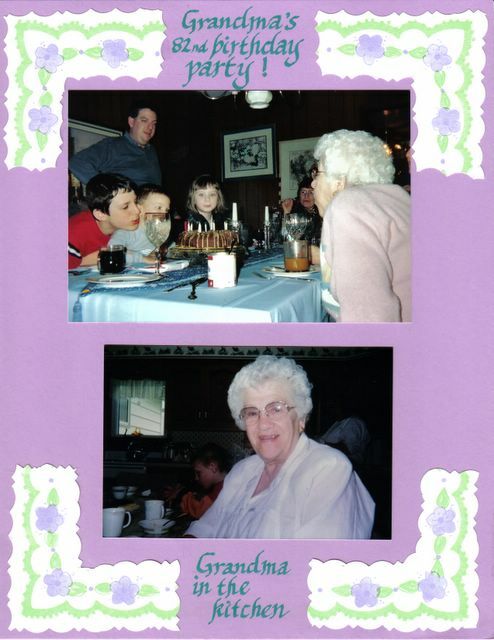 She's as intense about the candles as her great grandchildren. 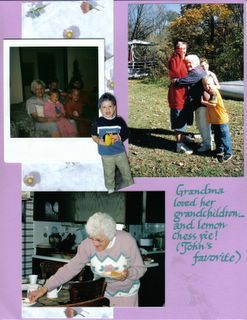 I absolutely adore the loving picture of Mom and the boys. Ricky is the middle sized grandson. And check her expression in the pie picture. 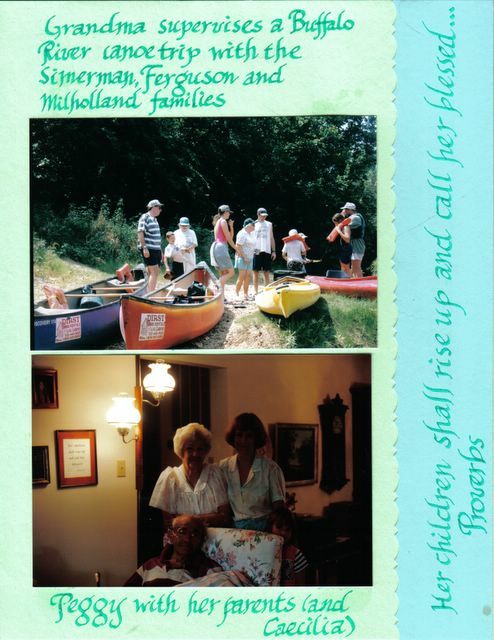 The top picture is from when she kayaked. 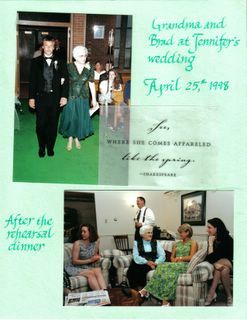 The bottom picture is during Dad's final illness when Mom nursed him so tenderly. Here's another picture with my young sons. 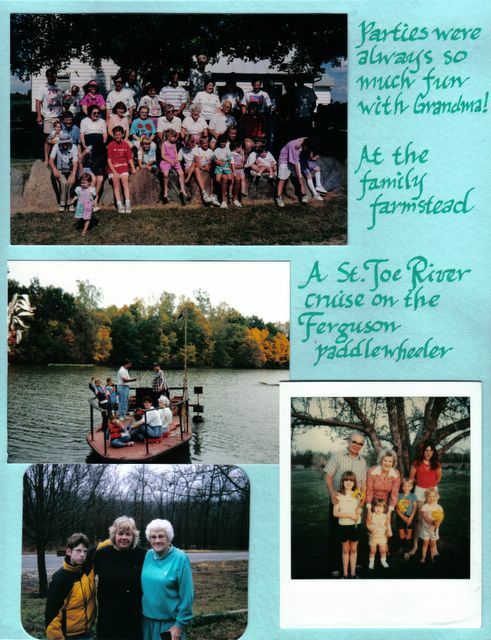 Mom's extended family, my husband's paddlewheel boat and my favorite picture of me and Mom (with Ricky making a face) my last spring with her. 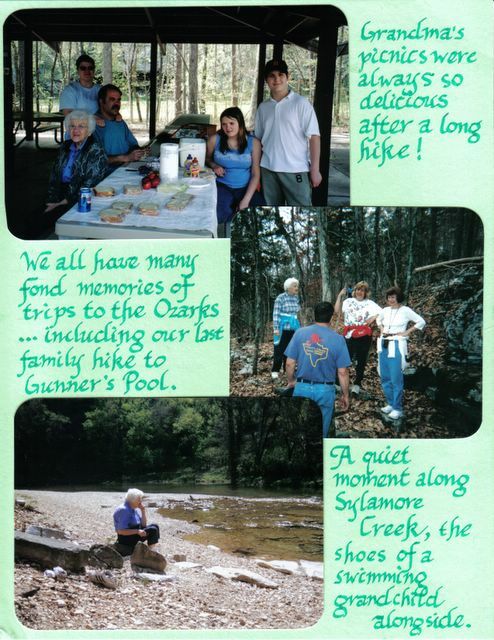 I have Mom's picnic basket which I cherish for all the memories surrounding it. 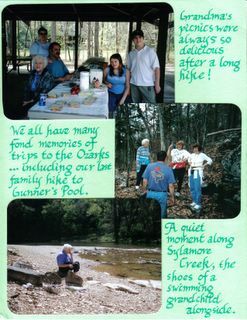 The middle picture is the hike from Gunners Pool to Blanchard Springs mentioned below. Mom's ready to go while I'm holding myself up with my staff. 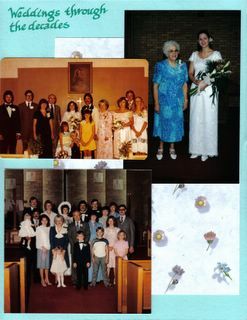 Weddings: her granddaughter's and her son's. That's a much younger me as a bridesmaid in the middle picture and I'm kind of buried as a bridesmaid in the bottom picture. I took the top picture because it was "so Mom." 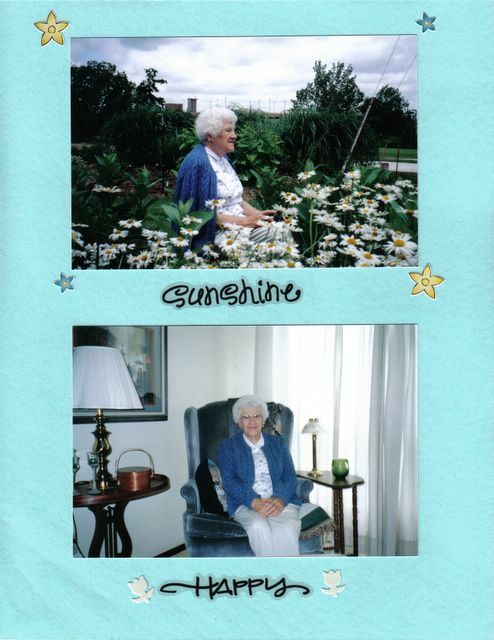 She was a whiz with words and loved to work crossword puzzles. The bottom picture was taken some years earlier. 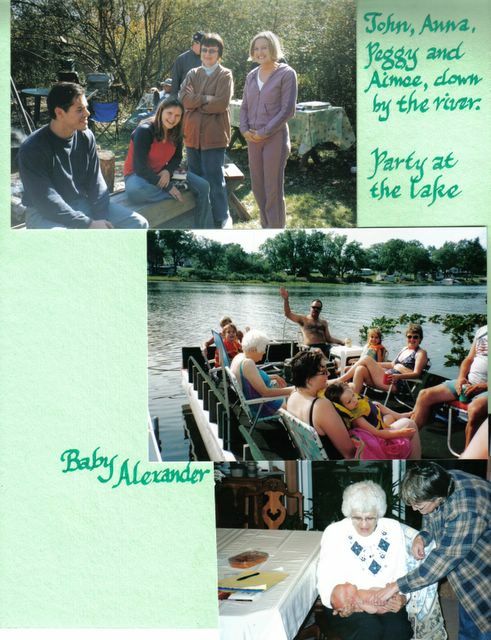 Top picture is the annual Bishop party at our river property and the bottom pictures are at my brother's lake home. My mother meets my sons. They are five years old and have been in my home for less than a week. Ricky is wearing his new book bag for kindergarden and I don't know why Ron is wearing a jacket in the middle of the summer. Note to my sister: Don't read this or get your hankie ready, preferably the gauzy embroidered hankies Mom saved from our childhood. For many years, I didn't realize how blessed I was by my mother, but I came to my senses long before she died. When Aunt Katherine remarked how much my sister and I reminded her of our mother, I know I beamed on the outside because I was beaming inside...except a part of me could not accept it. I'm more than satisfied if I am just a dim reflection of my mother. My siblings and I were not the only ones to be blessed by her. At her memorial, a 60 year old man fondly recalled the mission lessons she gave when he was a teenager. So many people recalled silent kindnesses. The neighbor lady related the joy of finding a kindred spirit. I was particularly moved by a friend's comments, moved to the point of trying to emulate Mom even more. 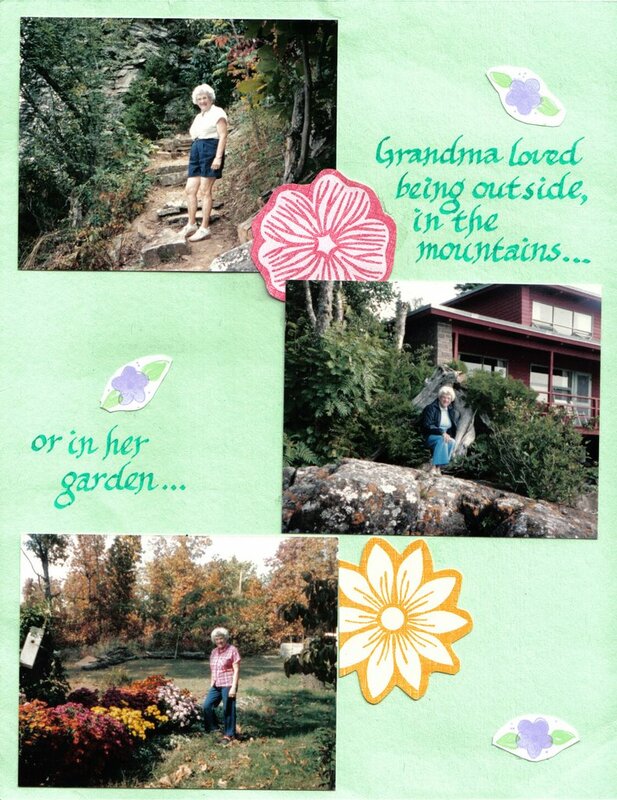 My friend did not know my mother, but due to the long line of people waiting to pay their respects, she had time to study the posters my nieces created of their grandmother's life. 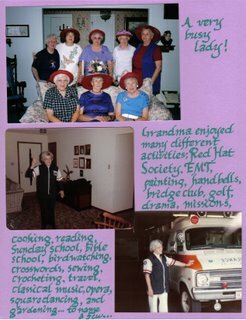 With tears in her eyes, my friend told me how lucky I was to have an active mother who embraced life, who was filled with joy, with fun and with love. It made me realize how many people do not have that type of mother and how much I want to be that mother to my sons. At the family interment of Mom's and Dad's ashes, all 30+ of us shared a memory of each of them and then sprinkled a shovel of dirt over their ashes. 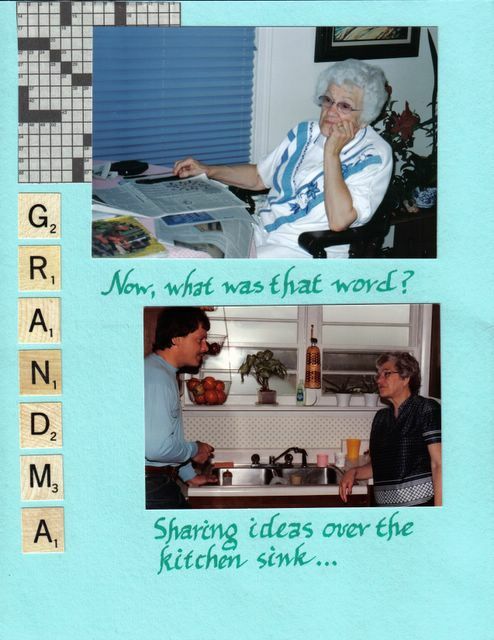 I talked about how Mom was "up for anything." 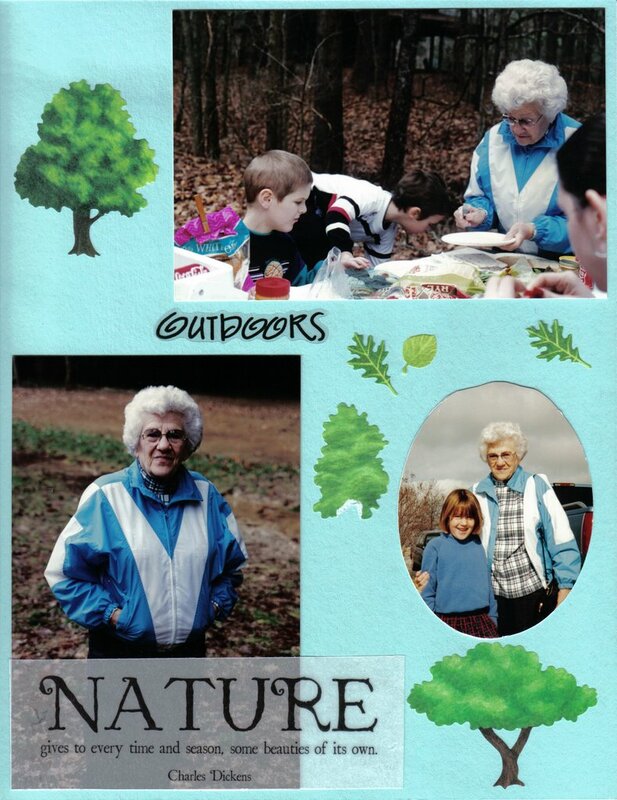 She went rappelling in her 70s with her granddaughters. She traveled overseas for the first time in her mid-70s and returned again and again, even taking a barge down the Rhine River. She went kayaking for the first time on Buffalo River with her children and grandchildren in her late 70s. She was 81 when she went tubing behind my brother's speedboat. 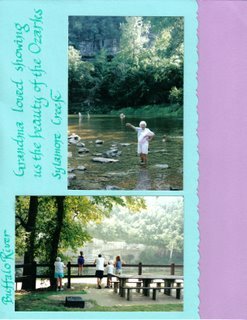 When she was 80 years old, my sister and I tried to talk her out of a long hike in the Ozark Mountains because of her bad knees. 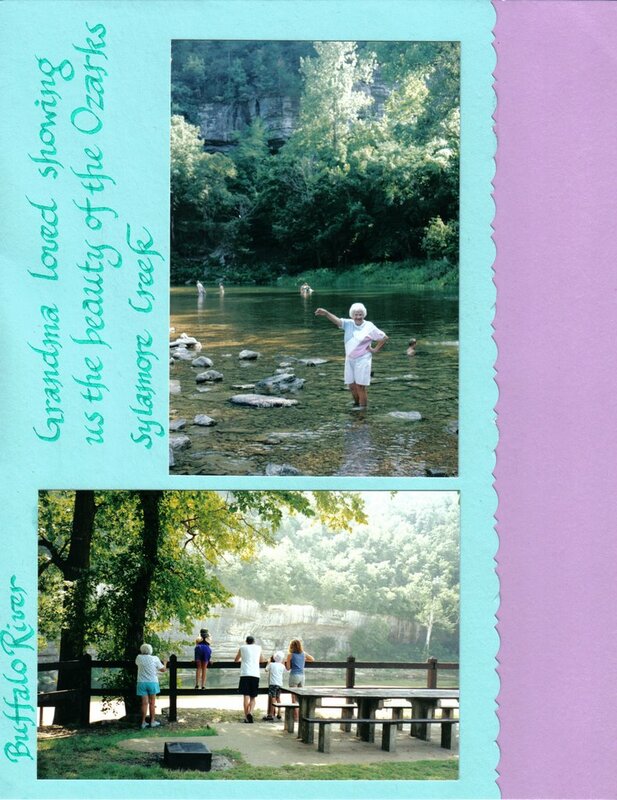 She would have none of that, outhiking all of us but her ten year old great-grandson, who ran up and down the Ozark Mountains along the trail. Her final illness came suddenly. After flu symptoms for two days, she was hospitalized for rehydration. The next morning, the "flu", belatedly diagnosed as sterile site pneumonia in her bloodstream, attacked her heart valves. When I got to her bedside that morning, held her hand and kissed her forehead, she squeezed my hand with the most beatific smile and her eyes filled with joy at seeing me. That was her final blessing on me. Pure love. Pure joy. Pure mother. I miss her so much. I've been feeling like a motherless child this spring. Oh, I know she has shaken the mortal coils of this fallen world. I can envision her feasting at the Lord's table, but I long once more to serve her a humble meal at my table. 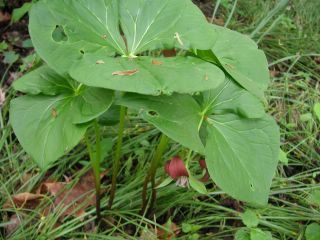 Variability within a plant species can be caused by environment or genes. These differences are all in the genes since they are within a few feet of each other in my garden. A few years ago, I was given a start of a double white columbine. 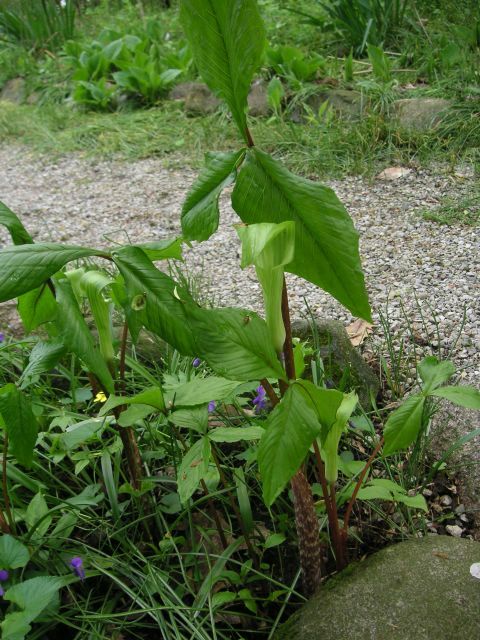 The first picture is of the original plant. The second picture is the closest plant to it in my garden today. It's not quite double but the spurs are long. The third picture is of another grandchild of the original columbine. Instead of double, there are four layers of petals and hardly any spurs at all. The fourth picture is of another grandchild which decided to have no spurs like her distance cousin, but also to add several more layers of petals and turn pink. The decision now is whether to let these plants cross-breed and see what happens or to pluck the blossoms of the ones I don't want to prevent cross-fertilization. It may even be too late to prevent pollenation. And which plants don't I want? I like the dainty shape of the long-spurred white one, but the crazy pink layered one is attractive in its own frilly overdone way. That's what has been keeping me away from posting the last week. The Garden and Wildflower Walk last Saturday was a big success. Sure, I put a lot of work into getting the garden ready and preparing a talk about the history of the garden and the vision to restore it historically. The show-stopper was the wisteria, though, which decided to bloom three weeks early. Then I had to get ready for the Master Naturalist test on Tuesday evening. There were eight 4-hour classes and I hadn't reviewed any of the material before Sunday. I studied hard, especially the technical stuff, such as the various lengths and angles of crystals. I got there last night and discovered it was an open book test! Boy, did I overstudy. 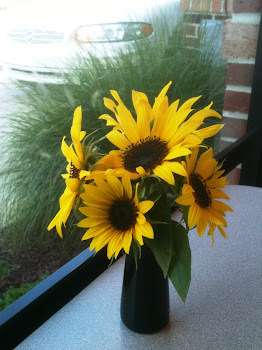 Not that I regret the learning, but I could have spent some time in my own garden. I received a call last night to tell me that I got 100%. Now I have to volunteer 30 hours to get my "badge." 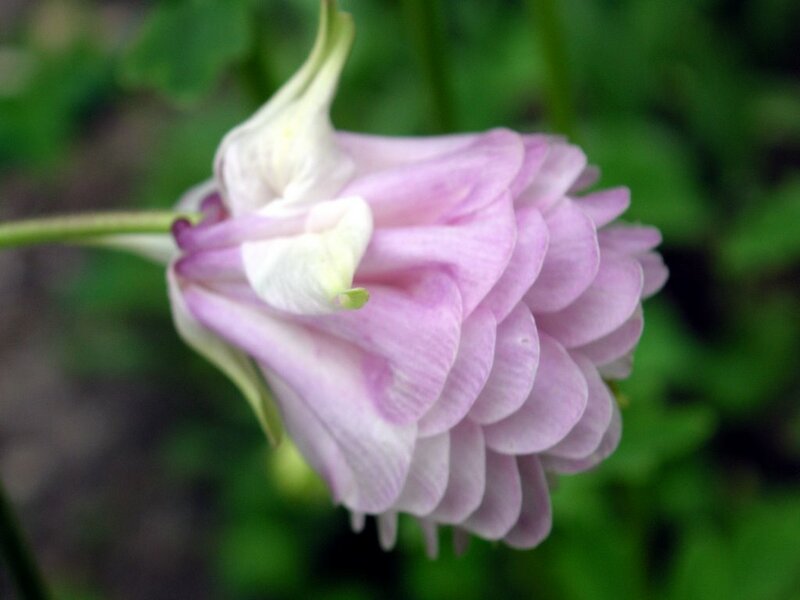 I need to ID this beautiful plant before I take 50 people on the garden walk this Saturday. 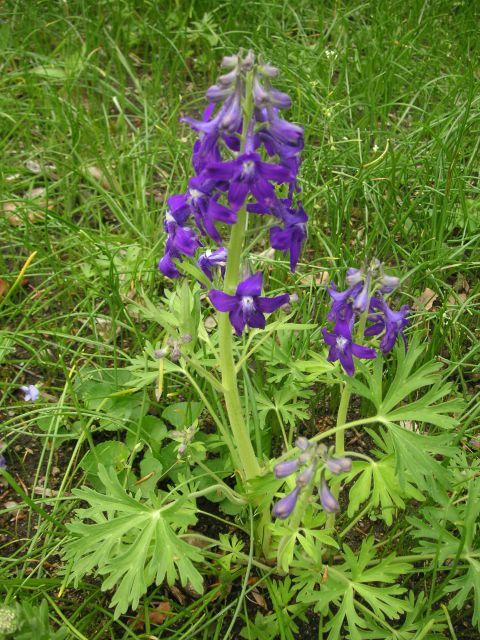 UPDATE: It is spring larkspur or dwarf larkspur (Delphinium tricorne). I was misled thinking it was a cultivated plant but it is wildflower. And go read Lucy's comment. She cracks me up. I may use her line Saturday if I flounder on another plant. This Jack is huge. I really need a reference point in the photo, but it is well over a foot tall. What is this plant? Three leaves. It's a trillium! But what type? 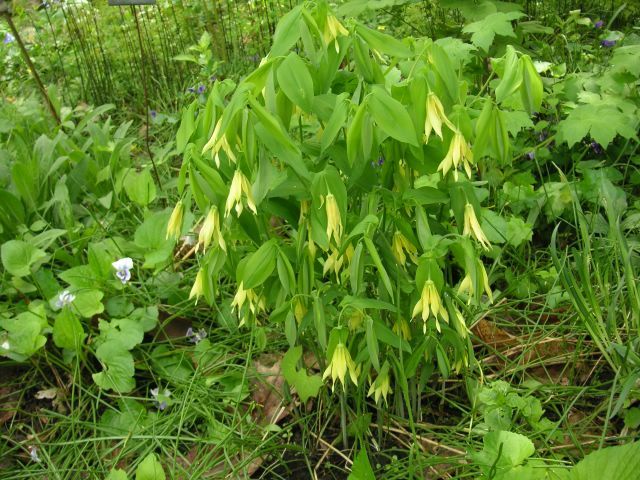 Wild oats or sensile bellwort. It's in the lily family. Isn't it beautiful? 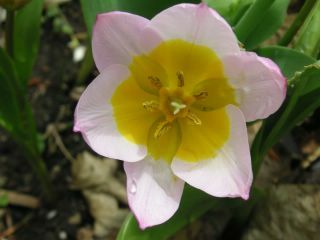 This gorgeous tulip is Lilac Wonder, a species tulip that is 4-6 inches tall, which we planted last fall along the arbor. I'm in love! The wild geranium is in bloom.